Everyone loves success. Well, maybe not your direct competitors. But even competitors recognize the benefits of a partnership to produce better services or higher quality products for the consumer. So how do you build genuine business relationships that are mutually beneficial as well as a long lasting? Collaboration is the key ingredient to a successful company, particularly in our industry of food. Here’s what I’ve learned on joining forces and creating relationships that matter. Most business professionals are smart. They know when executives are being insincere or deceitful. Consider how you answer questions and what promises you make. Nurturing authenticity in business transactions will result more positively for both of you. I’m a personable guy. I like to talk to people and I like talking in the traditional sense: in person. Sure, I’ll call or even text, but nothing beats a genuine face-to-face interaction for people to remember you. Innovation is the name of the game in an industry that’s constantly on the move. As a business owner and entrepreneur, I’ve anticipated changes over time and continue to adapt to the market trends. As technology advances, so must your business objectives. Otherwise, you’ll be left in the dust. At Calvetti Culinary Creations, our goal is to listen to our partners, understand their business and offer innovative solutions. We seek the “best of the best” industry partners who strive to be creative, collaborative, innovative so as to differentiate themselves from the pack.. But this doesn’t mean just doing something different to differentiate. It’s about being relevant and memorable. Consider our Transportation and Casio Banquet partners. We think about how we can help them differentiate from their competitors, my job is to consider their food offerings. We listen to them and then custom create for them products that are spectacular. When you board a premier airline and pay top dollar for your seat, you expect a superior experience. We help our partners to create that experience by offering products that beat expectations and evoke positive reactions. Items such seared and perfectly sous vide fillets, lamb Osso Bosco, and sea bass portions can be enjoyed in a luxury airliner at 30,000 feet, a cruise to the Bahamas or a 2,000 seat banquet. 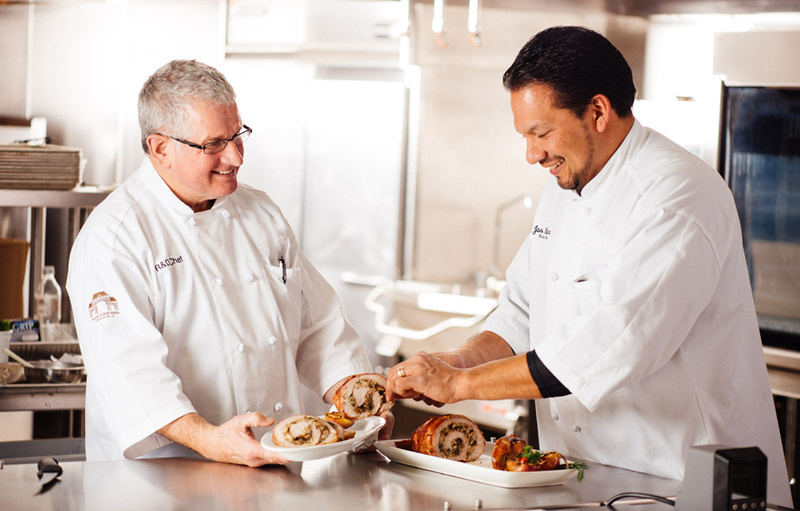 On the restaurant side, we work with chefs and Culinoligists who value an extraordinary dining experience. With our R&D and Sous Vide cooking capabilities, we offer ready to eat cuts of beef, lamb, seafood, vegetables and fruit (ever try a pear sous vide in port wine stuffed with Mascarpone cheese topped with a sprig of mint?) and revolutionize our partners’ offerings. These days, consumers want clean foods. This means meals without chemicals or additives and all natural ingredients. They insist on transparencyin their meals, but also balance: healthy and indulgent, sweet and spicy, and light as well as rich and complex. The Calvetti Culinary Creations Team, along with our genuine, French style sous vide cooking techniques (vacuumed sealed and slowly cooked in a water bath at low temperatures), provide the solution for all of these demanding requirements. Our supermarket partners are thrilled with how we pair a product in their store with one of our creations to bring new life to their cuisine. For example, our sous vide authentic Chashu pork belly is an incredible addition to a ramen noodle dish. From beef to vegetables to fruit, we do it all and whether you’re a business or home consumer, our portion-controlled sizes will satisfy your palette. In order to create relationships that matter, you have to keep up with your network. Sending a template LinkedIn connection request is not enough. Part of good relationship management is helping people to not forget you. I like to personalize my LinkedIn connection requests and when I see someone has viewed my profile, I reach out again and offer a visit to my plant or a meeting. It’s essential to stay relevant in this world of constant online chatter, but it’s also ever more important to build and foster relationships. Sales, networking and partnerships are all part of the process of satisfying your customers and helping your business thrive. The bottom line is that business relationships should create a more unique and preferable experience for the end user. And that’s our goal at James Calvetti Meats and Calvetti Culinary Creations a super dining experience no matter where you are in the world.